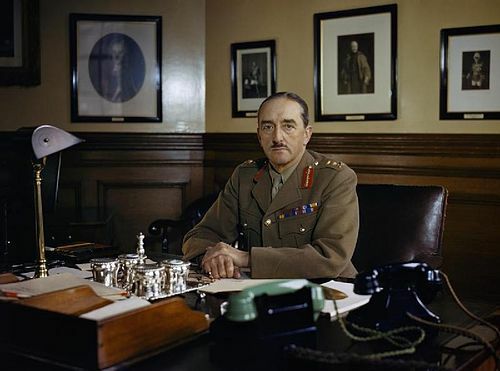 After the nerve rattling 24 hour delay, from the moment of the Supreme Commander’s decision at 0415 in the early morning hours of 5th June 1944 - all planned movements were immediately put into readiness for that evening. The messages went out and thousands of ships were brought to Action Stations. The first waves of transports set off across the English Channel from ports all along the coast. The main body was assembled in Portsmouth Harbour and assembled off the Isle of Wight at a spot referred to as ‘Piccadilly Circus’. Royal Navy Battleships & Cruisers were on station, ready to commence their formidable bombardment of beach defences. All five beach landings were carefully co-ordinated with RAF bombing, along with parachute and glider landings. Before departure, the troops had all been contained within a wired area all along the coast. Certainly they were aware of being part of something big, something historic, yet few details were passed down the ranks. Sea sickness was a common problem. Sea conditions were rough and many of the troops had been held on board longer than expected due to the delayed departure. In all, over five thousand ships and eleven thousand aircraft were engaged along with over one million troops organised in 37 divisions. Roughly half of the amassed troops were American, whilst the other half were British and Canadian. It was known that beach defences included a complexity of strong underwater obstructions, included steel and concrete wrecking devices. Inland routes were mined and barred with a variety of fortifications and tank traps, whilst the possible landing grounds were enfiladed by hidden batteries of artillery emplacements and heavy machine gun positions. 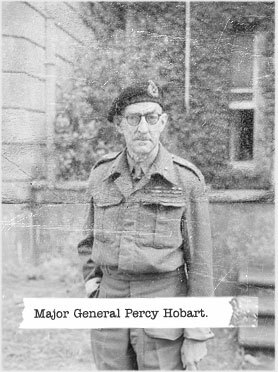 The plan was to get as many men as possible onto the beaches on that first day, supported of course with tanks, vehicles and equipment necessary to force their way forward and establish a beachhead. 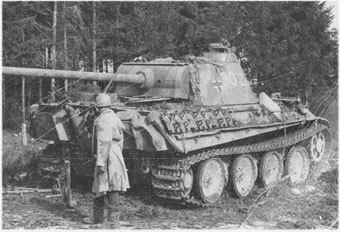 Intelligence reports of enemy strength indicated that Panzer divisions had been withdrawn from the Russian front in the early months of 1944. Of the 32 divisions in total, it was believed that by the beginning of June twelve divisions were based in France, or on their way. At least three of these were known to be within striking distance of the Normandy coast. “Armoured columns must penetrate deep inland and quickly on D-Day; this will upset the enemy’s plans and tend to hold him off while we build up strength. We must gain space rapidly and peg claims well inland. Landing crafts were loaded and set off for the shore. In total, nearly 5,000 landing ships and assault craft were escorted by hundreds of warships. Radar screens were filled with dots, bearing witness to the largest armada ever gathered. 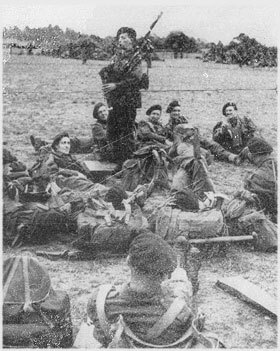 Lord Lovat’s commandos of the 1st Special Service Brigade were in the first wave. Lovat’s personal piper, Bill Millin of the Cameron Highlanders, stood on the bow playing ‘Road to the Isles’ bringing cheers from all around. 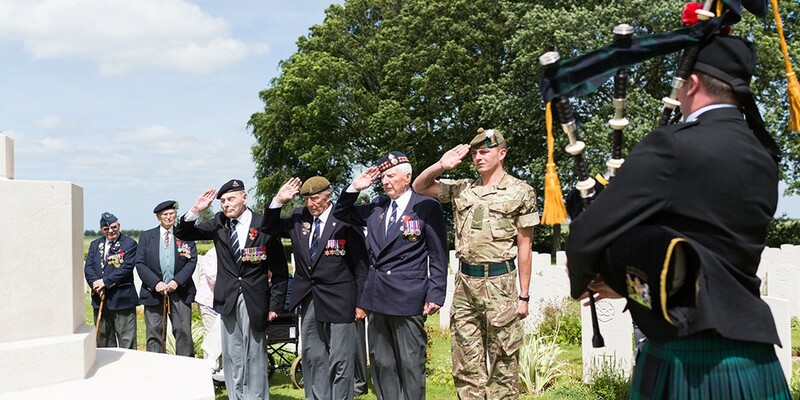 Upon landing, Lord Lovat is said to have ordered Bill Millin to march along the shoreline playing his pipes to lift the spirits of the troops landing under fire. Informed by Piper Millin that playing of the pipes was against King’s Regulations in a battle area, Lovat’s typically brief retort was to state that law was just for the English and didn’t apply to the Scots! So Millin duly played openly during that early stage of the Landings. Later, captured German defenders explained they refrained from shooting Millin simply because they thought he was mad. Piper Millin had met Lord Lovat in the Scottish Highlands at Achnacarry Castle which had been taken over as the training centre for Commandos and Special Forces. The Landings were critically combined with parachute & glider attacks on the Orne River crossings and the Merville battery. 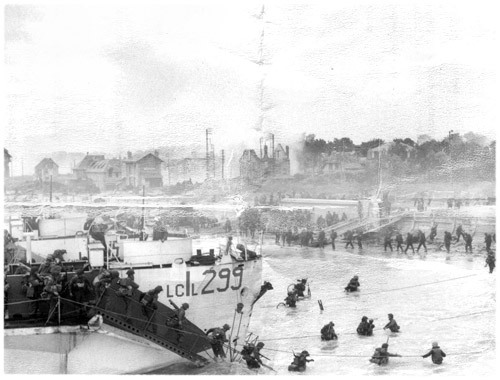 Lovat’s commandos were tasked with relieving the Paras at the crossing which became known as Pegasus Bridge. Piper Millin, in highland dress and armed only with pipes and ceremonial dirk, continued to play openly along the route. Many of the troops had been issued with Bicycles and landed awkwardly with these. The impression had been given that bicycles were an essential part of equipment, yet they were quickly dumped as unnecessary nuisances. On all five beaches, in excess of 150,000 troops landed on that first day. 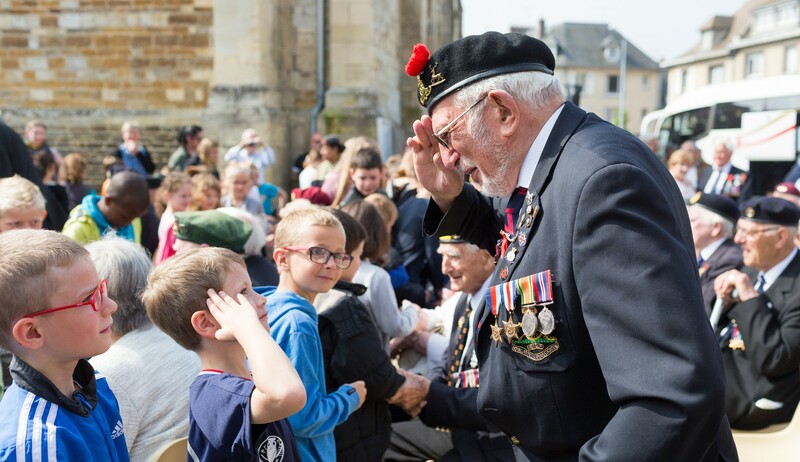 D-Day 6th June 1944… the Longest Day. With more men and material landing each day, the growing power of American and British forces began the steady drive inland. The plan was for British Forces to capture Caen, just 15 kilometers from Gold Beach, within the first few days after invasion. German strong points were overcome by Hobart's ‘funnies’ - ingenious tanks and other armoured vehicles designed to swim ashore under their own power – known as “DD” for Duplex Drive. This odd collection of tanks could lay paths and bridges or whirl chains mounted in front to strike the ground and explode a path through minefields. The infantry pressed rapidly inland and by nightfall British and Canadian troops had occupied a coastal strip 12 miles wide and 6 miles deep. The initial problem for defending forces resulted from their autocratic command structure; authorisation had to be sought personally from Hitler before any deployment of key Panzer divisions. Because the Fuhrer always slept late, no-one dared wake him on the morning of the invasion and it was some time before Hitler was informed. However, by the time these divisions were released, it was too late; the Allies were firmly ashore and the opportunity to drive them back into the sea had gone. Only the 21st Panzer Division attempted a major counter-attack on D-Day, and this fizzled out due to a serious lack of infantry support. Enemy reaction to the massed beach landings was slow and confused. Though reports of airborne and seaborne attacks had been pouring into German Headquarters since early morning, it was persistently believed that these were only diversions and the real weight of the allied invasion would come near Calais. 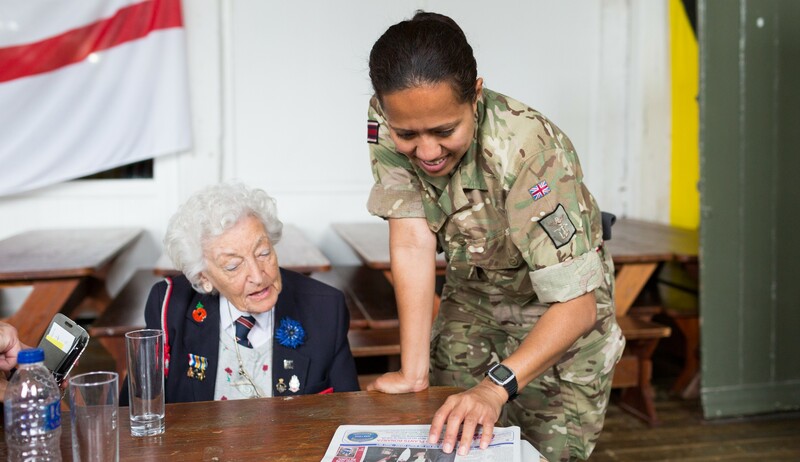 The intelligence deception codenamed ‘Operation Fortitude’ was proven successful, and it took valuable time for the Enemy command structure to accept the Normandy Landings was the real invasion. 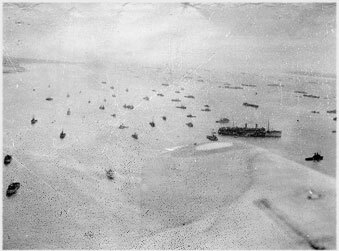 By 11 June the Allies had established a bridgehead 50 miles wide by 12 miles deep into which they poured a total of 326,547 men, 54,186 vehicles and 104,428 tons of supplies. Most of these were landed across the open beaches or in anchorages sheltered by breakwaters formed of sunken blockships.